Over the years campiagning on the doorstep I was always struck how many people were genuinely floating voters and ‘undecideds’. As we saw in the 2015 General Election people were making their decisions right up to the end of the campaign – even in the polling booth on the day. I have always struggled with the idea that people didn’t know where they stood by the start of an election campiagn – never mind half way through or on election day. I wondered how people could have so few values or knowledge to instantly know where their loyalties were going to fall. Of course my problem was always that people like me are the minority. Those who are actively interested in politics is very small and those who join parties and become tribal and always knowing where their values take them is even smaller. It is one of the challenges for modern politics – the breakdown of party loyalty. Even by election day in 2015, not having quite the same personal vested interest in the outcome I could see how the transactional nature of politics did have people comparing personal shopping lists of their personal circumstances versus the values of any particular party. This is how people think and we need to acknowledge that. To my horror at the start of the Labour Leadership election campiagn I found myself in the Don’t know/ undecided box. As I have written over the last few weeks how I know the candidates and whilst individually liking them all, and knowing ideologically where I am closest my test for my vote was always going to be who was best placed to build the coalition we created in 97 to win seats like Loughborough. Despite some friendly calls and texts from the candidates and their campaign teams – who are all very enthusiastic of course about why their candidate is best by a mile – I am afraid I haven’t seen any killer punch/ knock out blow or stand out moment yet that has convinced me which way to vote. I know I only have one of the 230,000 labour member party votes so I am not exactly crucial to any specific campaign. The truth is that I am still a floating voter and even I am fed up with my indecision. I will vote for all of the candidates of course. Tha’s the beauty of the electoral system. It is just in which order!? I am afraid I am not the only one. In discsussions with MPs and other leading campiagners – even those who have ‘declared’ I sense the unease about the quality and timing of this leadership campaign. I hope I am wrong and before ‘polling day’ it all becomes crystal clear who the ideal candidate will be. However, I am really looking forward for this campaign to become a little more exciting. The safety first poltiics isn’t working. Sending ‘signals’ to every pressure group in the party – who is best on TUs or LGBT rights isn’t working. I am assuming they all have good records on LGBT rights for example. I have talked about this before on election literature. Whenever a candidate makes a claim ‘for safer streets’ or “for cleaner streets’ I always want to ask them which candidate is therefore running on maker our streets unsafe or dirtier. I want to se in a Leadership campiagn, er well some Leadership. 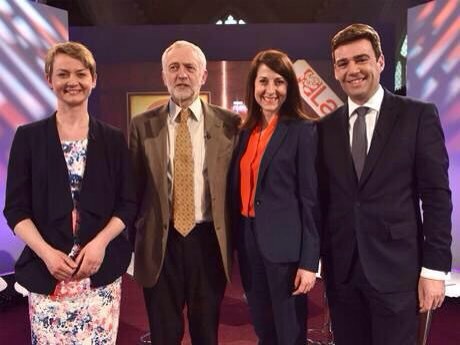 This entry was posted in andy burnham, jeremy corbyn, Labour, liz kendall, yvette cooper by andyreednet. Bookmark the permalink.